Beloved husband and father passed away Monday, January 30, 2017 at Covenant HealthCare. Age 69 years. Son of the late John and Armella (Faeth) Ursuy, Paul was born July 30, 1947 in Saginaw, Michigan. He married Judith A. Scherf on March 25, 1977. She survives him. 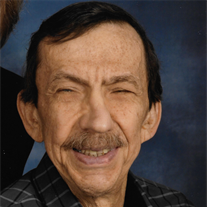 Paul was a machinist at Kuka Tool and Die retiring on July 30, 2012. He was a member of the Catholic Faith. Paul had a love for music, sports and playing cards. Paul was noted for his generosity with people. Surviving besides his wife Judy are one daughter and one son, Marie Ursuy, Indianapolis; Michael Ursuy, Wyoming; two brothers and one sister, George and Marilyn Ursuy, Gladwin; Catherine and David Banaszek, Saginaw; Joe and Judith Ursuy, Birch Run; several nieces and nephews. Paul was preceded in death by his sister, Mary Martinez and one brother, Michael Ursuy. Funeral Liturgy will take place 11:00 a.m. Saturday February 4, 2017 at Holy Spirit Catholic Church, 1035 N. River Rd., Saginaw. Rev. Fr. Peter J. Gaspeny will officiate. Honoring Mr. Ursuy’s wishes cremation will follow. Friends may visit at The Snow Funeral Home, 3775 N. Center Rd. (between Shattuck and McCarty), where the family will be present on Friday from 3:00 p.m. to 8:00 p.m. and on Saturday at the church from 10:00 a.m. until time of Mass. A Vigil Service will take place 7:00 p.m. Friday at the funeral home. Those planning an expression of sympathy may wish to consider memorials to the Wounded Warriors or Holy Spirit Catholic Church.